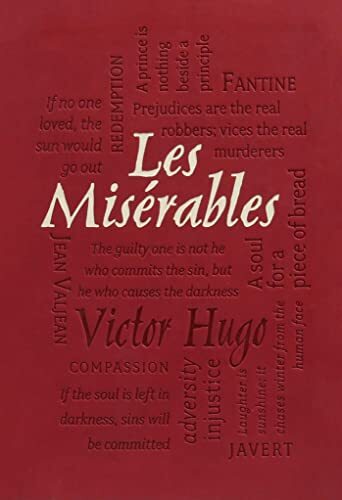 Les Miserables is the first book I've read by Victor Hugo. At over 1200 pages, it's taken me several months to finish. My reactions during those months have fluctuated between absorption, admiration, boredom, and excitement. There's a lot of everything in it--adventure, philosphical lecturing, history, social commentary, war, romance. By the time I finished, I had formed an almost affectionate impression in my mind of Hugo as someone who just couldn't bring himself to leave anything out. The story is mainly that of Jean Valjean, a man who served 25 years hard labor for stealing a loaf of bread when his family was starving. He and the many other suffering poor in the story are the "miserable ones" of the title. He comes out of prison a hardened criminal, and the book, with many (many!) digressions, tells the story of his spiritual redemption. That story is compelling. Valjean, coming out of prison, is an outcast from society. No inn will feed or shelter him. He is advised to go to the Bishop's house. The good Bishop takes him in, Valjean robs him, and the Bishop forgives him. He sends Valjean on his way, along with what he stole, and tells him: "Do not forget, do not ever forget, that you have promised me to use the money to make yourself an honest man... you no longer belong to what is evil but to what is good. I have bought your soul to save it..."
Part of the reason the Bishop's words are so moving is that Hugo has spent the last 80-odd pages telling the man's life story. We know the Bishop, and we are pretty much in love with him; he is that sweet and good a human being. The Bishop will not appear again in the novel, but thanks to the mini-bio we understand, before Valjean gets to the Bishop's house, what a force for goodness he is about to come into contact with. Hugo does this again and again in the novel--provides huge chunks of backround history before introducing a character or before a major plot event. Sometimes it's effective, as just described, and sometimes it's merely boring, as when a 50-page description of the battle of Waterloo, including extensive discussion of both Napoleon's and Wellington's personalities, precedes the introduction of two soldiers we will not meet until much later in the book. This sincerity of filth pleases us and soothes the spirit. When one has spent one's time on earth suffering the windy outpourings which call themselves statesmanship, political wisdom, human justice, professional probity, the robes of incorruptibility, it is soothing to go into the sewer and see the mire which is appropriate to all this. In the matter of prim hypocrisy Mlle. Gillenormand could have given points to an English miss. She carried prudishness to the point of imbecility. Her life was haunted by a terrible memory: a man had once seen her garter. For the rest, he had never succeeded in being as fond of any woman as he could be of a tulip-bulb, or of any man as of a manuscript. When he was well past sixty, someone had asked him, "Were you never married?" and he had answered, "I forget." As I said, this was my first Victor Hugo. I've enjoyed it enough to consider adding some of his other work to my TBR list--and that list is much too long already. I had a similar experience with Hugo's Nôtre-Dame de Paris. Details, details and more details about Gothic Architecture because he loved it. More details about the French judicial system because he hated it. As luck would have it, I read that if I skip one or tow chapters I'd loose no storyline and gain time. I think I'd like to look more into his poetry....after reading this: Demain, dès l'aube. It's beautiful in english and unforgetable in french. Just googled that and, oh, is it lovely. Thank you. It's a challenging book for sure, I thought I would never finish it but it's well worth the time.